The World Health Organization (WHO) re-raise the level of warning against the danger of disease of swine flu, from phases 4 to phases 5. This means that the virus has spread from human to human, and occur in at least two countries. While the most dangerous level is phases 6 , namely in case of a global pandemic. Diseases of swine flu was widespread and continues to devour the soul of the victim. In Mexico, country of origin of disease, the victims killed has reached 159 people. While the number of digits penetrate nearly 2500 people. Meanwhile in Houston, Texas, United States, a child aged two years who suffered from flu-positive pigs died. This is the first victim of swine flu in the U.S.. This child is one of the 16 positive cases of swine flu in Texas. Not to mention a number of other cases in the city in the U.S.. Because such fears appear to close the discourse U.S. - Mexican border. 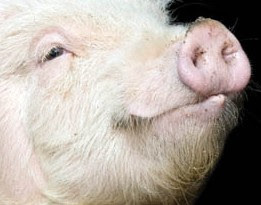 Not only in the U.S., swine flu case is also found in Europe. After English and Spanish, German government's turn to report the spread of H1N1 virus in their countries. Now, each state must immediately activate the emergency plan handling pandemic. WHO calls for cautious so that the spread of diseases like flu and pneumonia severe. In addition, provide antiviral drugs and if at any time needed.